From the very beginning I knew that the dark tone Smoke and Sacrifice brings to the table would draw me in. 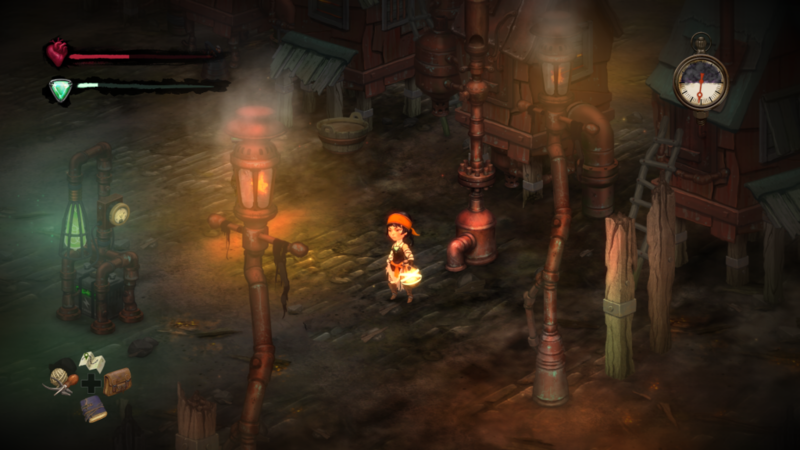 First, I thought, well this looks like another Don’t Starve; boy was I wrong. The dystopian setting, in-depth crafting, non-forgiving combat system, and a new twist on a day/night cycle all attribute to how unique Smoke & Sacrifice is. Any one of the aforementioned things would be enough for me to play, but where I think Smoke and Sacrifice shines the most is the compelling story about a mother looking for her lost child. Typically, with survival crafting games, I will play for an hour or two, look at the recipes and build as much as I possibly can, then never play again. Smoke and Sacrifice is different; the linear story telling gives me something to strive for, rather than just surviving. When playing Smoke and Sacrifice the first thing that caught my attention was the art; it’s gorgeous. 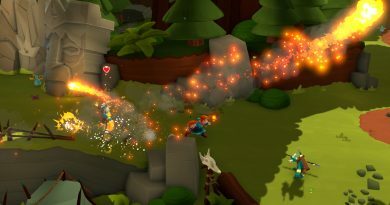 From the hand-painted sprites to the particle effects that cause bugs to glow and barrels to explode. Solar Sail Games and their team of artists really know how to bring out the mood with their use of colors. Each area is distinct and not like the rest. You feel like you are transported to another dimension…even though you walk a few tiles to the left or right. You can really see the hard work put into each area, getting the personality just right and not just recoloring existing assets. Smoke and Sacrifice features some of the best art I’ve seen in years, and if you play games for aesthetics alone, picking up Smoke and Sacrifice is a no-brainer. 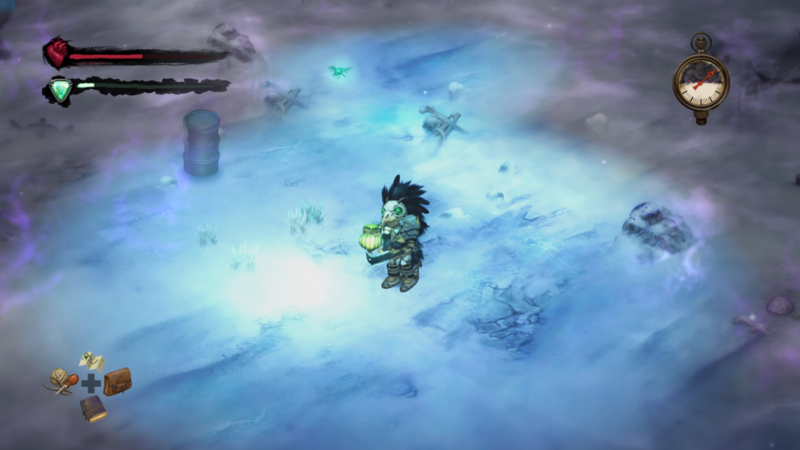 This is one of the villages in the game. The lighting and hand draw art really brings the creepy level up. I love it. The world is your oyster, and a big one at that. Every inch of the playable map has enemies, chests, and things you can smash to bits for goodies. With a map so big you need some sort of travel other than by foot, right? Well, Smoke and Sacrifice has got you covered. With in-game currency you can unlock “travel tubes” that will teleport you to any previously unlocked tube, free of charge (after the initial investment that is). As previously mentioned, each area has a unique look and feel to it. Icey Wasteland, Molten Fields, Infested Swamps, and a few villages here and there. Each area requires a specific piece of armor to traverse it, similar to the The Legend of Zelda franchise. For example, you’ll need a heat-resistant tunic for hot places…like the fire temple. Check out how large this map is. I haven’t even scratched the surface! Out in the icy wasteland hunting some materials, ready to rumble. There are plenty of recipes for you to craft throughout the game. 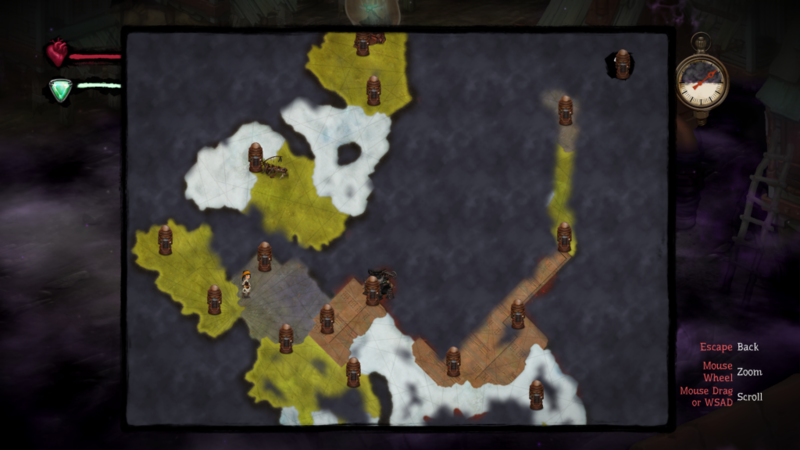 Scattered all around the map are places where you can learn new recipes. It is very possible to run through the game and miss certain spots of the map, so be vigilant in your journey to be the best crafter there is. The excitement and curiosity of “What will I find next” should have you searching every nook and cranny of the map. Nothing beats the feeling of unlocking the next weapon in your crafting book…except for crafting that weapon. Finally, there are two things bug me the most while playing Smoke and Sacrifice. The first would be the fact that there are no keybinds for consumable items. This one hurts the flow of combat for me. Nothing kills the excitement of battle more than having to navigate through a menu to select something that will boost resistances or heal. Speaking of crafting, the lack of stats or full descriptions on items would be the second. On armor and weapons this is excusable due to the natural progression of the game. Each new area has a specific set of armor and weapons based on what you unlock. 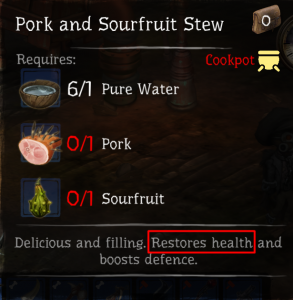 For consumables, it would be nice to see the amount it heals for rather than “Restores Health” (see above). I wouldn’t want to spend time farming materials to cook up a yummy dish if it heals no more than the materials themselves. After sinking hours of time into Smoke and Sacrifice, I must give it a “Gewd.” rating. I’ve really enjoyed what I have played through so far and can’t wait to finish the story. If you like action-adventure survival games with strong storytelling, I suggest buying this gem at launch. The extensive list of craftable items will have you collecting materials hour after hour so that you are well stocked to venture through the underworld Smoke and Sacrifice throws at you. I wish I could tell you more about the game, but I wouldn’t want to spoil any of the twists and turns or locked recipes. 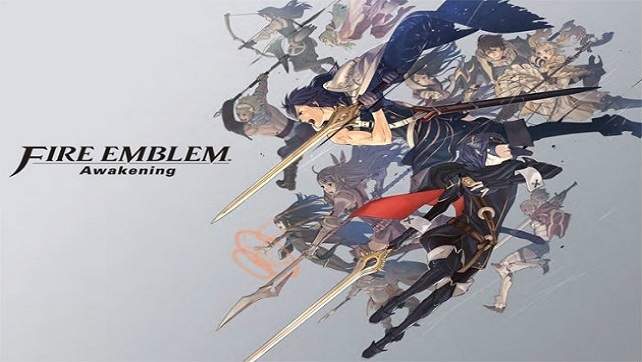 There is one thing I can tell you though…BUY THE GAME!